These findings emerge from a new, nationally representative bilingual telephone survey of 1,001 Hispanic adults conducted from Dec. 7, 2016, through Jan. 15, 2017, on landline and cellular telephones by SSRS for Pew Research Center. The survey’s margin of error for the full sample is plus or minus 3.6 percentage points at the 95% confidence level. The U.S. Hispanic population stood at 57 million in 2015 and is among the nation’s fastest growing groups. It is also a largely U.S.-born population – 66% were born here. Among Hispanics who were born in another country, roughly three-in-ten are lawful permanent residents and about four-in-ten are unauthorized immigrants. (Unauthorized immigrants from Latin America make up 78% of all unauthorized immigrants as well.) At the same time, the group’s population growth has slowed in recent years and is now driven more by births in the U.S. than the arrival of new immigrants, driving down the group’s foreign-born share in recent years. The U.S. Department of Homeland Security this week issued new immigration enforcement policies that widen the pool of unauthorized immigrants prioritized for deportation to include those who have committed an act that will result in criminal charges, those charged with a crime but not convicted, and those convicted of a criminal offense regardless of severity, among other things.2 In recent weeks, immigrants around the nation have grown concerned about stepped-up deporations under the new administration. Worries about deportation among immigrants are greatest for those who do not hold U.S. citizenship and do not hold a green card: 67% say they worry a lot (45%) or some (22%) about the deportation of themselves or someone close to them. And among immigrants who are lawful permanent residents, 66% say they are worried about deportation of themselves or someone close to them. Both of these groups are potentially subject to deportation. By comparison, one-third (33%) of U.S.-born Hispanics say they are worried about deportation of someone they know, while 55% say they worry not much or not at all about deportation. Deportation concerns among Hispanics are little changed from 2013, when 46% of Hispanics said they worried, and is down from 52% in 2010. Overall, all major subgroups of Hispanics have seen a decline in their worry about deportation or no change in recent years. For example, in 2010, 84% of Hispanic immigrants who were not U.S. citizens and not lawful permanent residents said they worried a lot or some that they or someone close to them could be deported, about 17 percentage points higher than today. Meantime, the share of U.S.-born Hispanics who said the same in 2010 was 32%, similar to today’s 33%. Despite the prominence of immigration issues in last year’s presidential campaign, U.S. Hispanics do not rate them a top issue for the new administration or Congress, a pattern similar to that found in previous years of polling by Pew Research Center. According to the new survey, 46% say dealing with the issue of immigration should be a top priority for the new administration and Congress in 2017, ranking last among the five priorities tested in the new survey. Instead, Hispanics identify education as a top priority issue for the new Trump administration and for the new Congress among those tested. Fully 73% say improving the educational system should be a top priority in 2017. Other top priorities include defending the country from future terrorist attacks (69%) and strengthening the nation’s economy (66%). Following these three issues is reducing health care costs (54%). 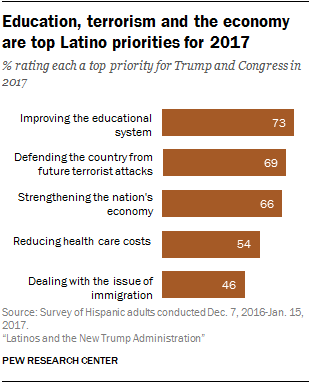 This rating of issue priorities among Latinos is similar to that of the U.S. general public, though there are some differences. According to a recent Pew Research Center survey of U.S. adults, defending the country from terrorism (76%), strengthening the nation’s economy (73%) and improving the educational system (69%) are rated as the top three prirorities of more than 20 tested. On terrorism and the economy, the share of U.S. adults who rate these as top issues is higher than the share of Latinos who say the same. On reducing health care costs, 66% rate the issue as a top priority for Trump and Congress, again a higher share than among Latinos. Meanwhile, on immigration, 43% of U.S. adults say immigration is a top priority, a share similar to that of Latinos. 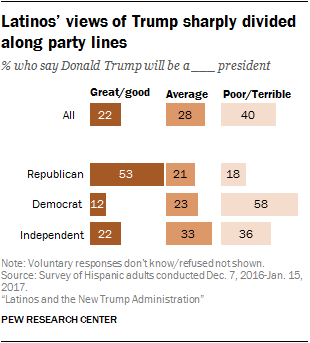 Latino views about the kind of president Trump will be and how former President Obama’s administration will be viewed splits along party lines. Divisions along party lines also exist in Latinos’ views about the Obama administration. Two-thirds (66%) of Latino Democrats say his administration’s accomplishments will be better remembered than its failures. By contrast, 59% of Latino Republicans say the failures will outweigh accomplishments. Overall, half of Latinos (48%) say the Obama administration’s accomplishments will outweigh its failures, while 36% say the opposite. “U.S. born” refers to people who say they were born in the 50 states or the District of Columbia, Puerto Rico or other U.S. territories, and those born elsewhere to at least one parent who is a U.S. citizen. “Foreign born” refers to people who say they were born outside of the United States or other U.S. territories to parents who were not U.S. citizens. The following terms are used to describe immigrants and their status in the U.S. In some cases, they differ from official government definitions because of limitations in the available survey data. “Foreign-born lawful permanent residents” refers to persons who indicate they are foreign born and who say they have a green card or have been approved for one. “Foreign born who are not lawful permanent residents and not U.S. citizens” refers to persons who indicate they are foreign born and who say they do not have a green card and have not been approved for one.